Rod Abrams Funeral Home Ltd. – Tottenham Beeton & District Chamber of Commerce Inc.
[vc_row][vc_column][vc_column_text]Rod Abrams Funeral Home Ltd.
Rod Abrams of Rod Abrams Funeral Home Ltd. recently celebrated 50 years as a licensed Funeral Director. Rod, son of Stella and Clifford Abrams, has deep roots in the Tottenham community. Rod was born and raised in Tottenham, but left in the mid 60s to pursue a career as a Funeral Director. In 1973, Rod returned home to Tottenham where he purchased the local Funeral Home and established it as the Rod Abrams Funeral Home. Rod has also been a long time member of the Chamber as was his father before him. In fact, the Abrams have been members of the Tottenham Chamber (and its various incarnations) for well over 50 years. Clifford Abrams was a farmer and served as the Chamber’s Treasurer. 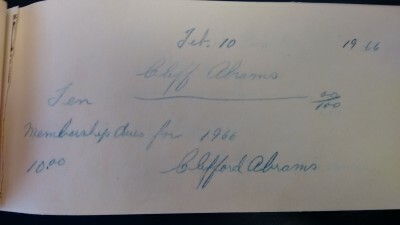 The Chamber recently found a receipt book from 1966 and there was Cliff’s signature throughout. That receipt book also helped us identify members who have been with us for fifty years. The Rod Abrams Funeral Home truly is a family business with Rod’s wife Sue and son Scott working alongside him as well as Allan Blakely, licensed Funeral Director. The Rod Abrams Funeral Home has served the community for over 40 years. In 1988 a new, 12,000 square foot funeral home was built and features parking for up to 200 cars, seating for 300 people, balcony for 25, and a room for family. The Rod Abrams Funeral Home is located at 1666 Tottenham Road at the south end of Tottenham.